Inspiration hit, you type out this amazing blurb. You thank your muse. And go back to read it and it is gone. Not saved... That was the first paragraph of this blog. I am in research mode and not for anything in particular but synchronicity will peak my interest in a topic then due to Youtube and algorithms that I would rather no nothing about. I start seeing certain topics in my life more and more so I must consume all I can on that topic until I have a general idea on the said topic. Particularly Nikola Tesla, dreams, alternate universes, and philosophy. I will try to create some of the thoughts and ideas in the lost paragraph, but it will never be the same. I am a social worker and many times I am dealing with children, parents and even coworkers that are upset and what seems inconsolable. I have been learning about meditation and yoga lightly for years but I know I am an amateur so I do not speak up about it very often. But a few times this year in my job I saw places that just some deep breathing could possibly solve an issue if not give the person a moment of calm to get a fresh perspective. One was a child crying and agitated. 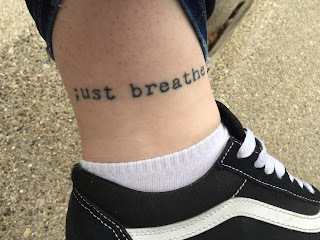 I asked the child to do a three-step breathing exercise that I do with my son, where we stretch our arms to the sky greeting the sun inhaling through the nose, holding the breath as we bring the hands to our center solar plexus for a second to hold the breath and then releasing the breath and we reach to the ground to touch our toes. And repeat. I did this with a screaming crying child and within a minute he was fine. The sobs stopped and he finished a round of 10. Another time a co-worker was agitated with parents and just a few weeks ago. He knew about the three-step breathing I had done with the upset child. It was the first thing out of his mouth-- he refused, thinking he would look silly. So I asked him to just breathe in through his nose holds it then exhale the negative thoughts out through his mouth. Repeating it a few times. Which he was willing to do. He only did about three but his shoulders relaxed and a smile came to his lips. Even he was a little surprised that just a few breaths brought him back to a calm he thought was gone for the day. Our bodies do so much automatically without our knowledge, the brain, all our organs, and systems are working day and night to keep us alive. But when we can override the computer and take back some control, we can learn to be in control of our bodies even in the most stressful and what may seem overwhelming. And the easiest and healthiest way seems to be with the breath. Our lungs will breathe without our help. But when we control the air as it comes through the nostrils and hold it for a count of x. Then exhale for a count of four, the I that isn't our mind or our body is in control. Because we are not our bodies and we are not our brains. But through the overriding of these systems, we are taking back control but also letting go of that freedom of thought that many times accompanies the breathing focus. Then feelings and emotions are no longer in control, we are. And that is the real power, the real goal of this life. Learning to control our inside leads to not allowing the outside (People and situations) to control us.